42 mm stainless steel case with polished and satin finish, screw-down winding crown engraved with Tudor logo, chronograph pushers in steel with black PVD-coated cylinders, Rapid date corrector with PVD shield motif at 9 o’clock on the middle case, fixed steel bezel with engraved tachymetric scale, sapphire crystal, black dial with Arabic numerals, Tudor caliber 7753 self-winding movement with chronograph function, 30-minute totalizer at 3 o’clock and 12-hour totalizer at 6 o'clock, small seconds hand at 9 o'clock, date at 4:30, approximately 46 hours of power reserve, stainless steel and 18K pink gold bracelet with folding clasp and safety catch, watch supplied with additional black and grey fabric strap with buckle. Water resistant to 500 ft (150 m). 42 mm stainless steel case with polished and satin finish, screw-down winding crown engraved with Tudor logo, chronograph pushers in steel with black PVD-coated cylinders, Rapid date corrector with PVD shield motif at 9 o’clock on the middle case, fixed steel bezel with engraved tachymetric scale, sapphire crystal, black dial with index hour markers, Tudor caliber 7753 self-winding movement with chronograph function, 30-minute totalizer at 3 o’clock and 12-hour totalizer at 6 o'clock, small seconds hand at 9 o'clock, date at 4:30, approximately 46 hours of power reserve, stainless steel and 18K pink gold bracelet with folding clasp and safety catch, watch supplied with additional black and grey fabric strap with buckle. Water resistant to 500 ft (150 m). 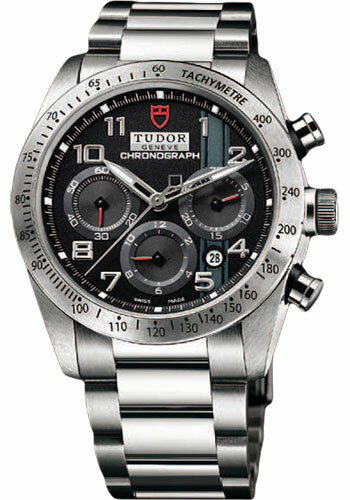 42 mm stainless steel case with polished and satin finish, screw-down winding crown engraved with Tudor logo, chronograph pushers in steel with black PVD-coated cylinders, Rapid date corrector with PVD shield motif at 9 o’clock on the middle case, fixed steel bezel with engraved tachymetric scale, sapphire crystal, silver dial with Arabic numerals, Tudor caliber 7753 self-winding movement with chronograph function, 30-minute totalizer at 3 o’clock and 12-hour totalizer at 6 o'clock, small seconds hand at 9 o'clock, date at 4:30, approximately 46 hours of power reserve, stainless steel and 18K pink gold bracelet with folding clasp and safety catch, watch supplied with additional black and grey fabric strap with buckle. Water resistant to 500 ft (150 m). 42 mm stainless steel case with polished and satin finish, screw-down winding crown engraved with Tudor logo, chronograph pushers in steel with black PVD-coated cylinders, Rapid date corrector with PVD shield motif at 9 o’clock on the middle case, fixed steel bezel with engraved tachymetric scale, sapphire crystal, silver dial with index hour markers, Tudor caliber 7753 self-winding movement with chronograph function, 30-minute totalizer at 3 o’clock and 12-hour totalizer at 6 o'clock, small seconds hand at 9 o'clock, date at 4:30, approximately 46 hours of power reserve, stainless steel and 18K pink gold bracelet with folding clasp and safety catch, watch supplied with additional black and grey fabric strap with buckle. Water resistant to 500 ft (150 m). 42 mm stainless steel case with polished and satin finish, screw-down winding crown engraved with Tudor logo, chronograph pushers in steel with black PVD-coated cylinders, Rapid date corrector with PVD shield motif at 9 o’clock on the middle case, fixed steel bezel with engraved tachymetric scale, sapphire crystal, white dial with Arabic numerals, Tudor caliber 7753 self-winding movement with chronograph function, 30-minute totalizer at 3 o’clock and 12-hour totalizer at 6 o'clock, small seconds hand at 9 o'clock, date at 4:30, approximately 46 hours of power reserve, stainless steel and 18K pink gold bracelet with folding clasp and safety catch, watch supplied with additional black and grey fabric strap with buckle. Water resistant to 500 ft (150 m).